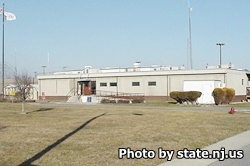 Southern State Correctional Facility is located in Delmont New Jersey, part of Cumberland County. The prison is situated adjecent to Bayside State Prison. Inmates are housed in open dormitories. Currently this facility can house over 2,050 adult male inmates. While incarcerated at Southern State Correctional Facility inmates can earn a GED and take a various vocational classes to learn a new skill. Offenders can also receive substance abuse treatment, counseling, medical, dental and psychological treatments during their incarceration. A maximum of four adults and an unlimited number of children may attend a visiting session as long as space permits. This facility uses an alternating schedule that changes monthly, so you will need to call the facility to verify the current rotation. Saturdays and Sundays from 8:30am-11am and 12:15pm-3pm (registration is from 8:15am-10am and 12pm-1:45pm). Saturdays and Sundays from 8:30am-10:30am and from 12:30pm-3pm (registration is from 8am-10am and 12pm-2pm). How long do it take to approve a number to the inmates call list ?